Coach Mike Zimmer chatted with local reporters this morning for the first time since early January, a couple of days after the 2016 season ended. Coach Mike Zimmer chatted with local reporters this morning for the first time since early January, a couple of days after the 2016 season ended. He opened the session by joking that he told the PR staff to tell us he was having emergency eye surgery again as a way to get out of talking. So, since you brought up the eye, where do things stand with that? Zimmer said that he is still scheduled to have a fifth procedure done on his right eye in April, a couple of weeks before the NFL draft. Because that surgery will prevent him from flying for three weeks, he has been waiting to do it until after this week’s combine and the pro-day circuit. He added that two months later, he will have cataracts surgery, too. 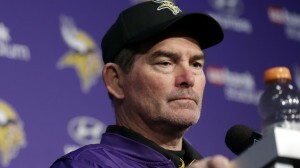 However, Zimmer said he was told that there is a “high likelihood” that he could experience similar vision issues in his other eye down the road.